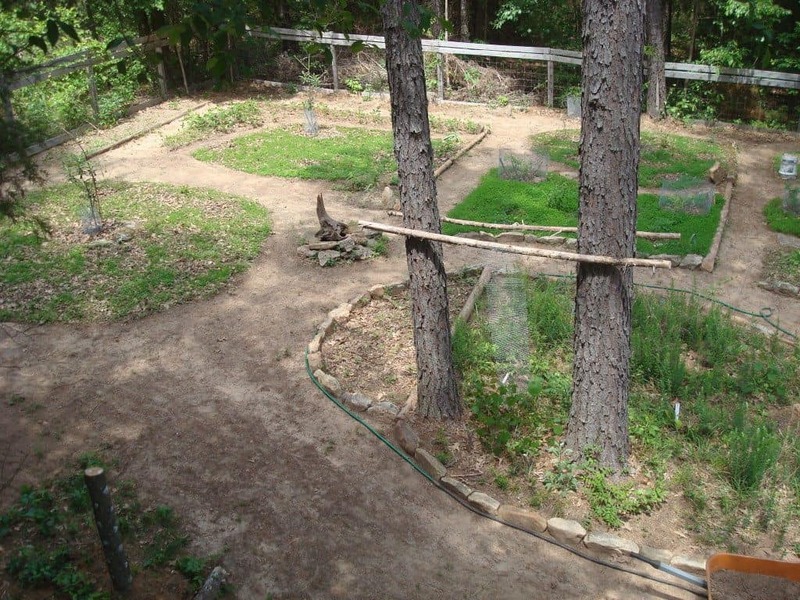 This is Part 1 in our Permaculture 101 series, check out Part 2: Zones and Part 3: Forest Gardens! I’m sure many of you have wondered, “What is this Permaculture I’ve been hearing about, anyways?” It’s a good question and today I’m going to hand this topic over to Joel (my other half) who has his Permaculture Design Certificate and also studies the topic pretty much every moment that he can. 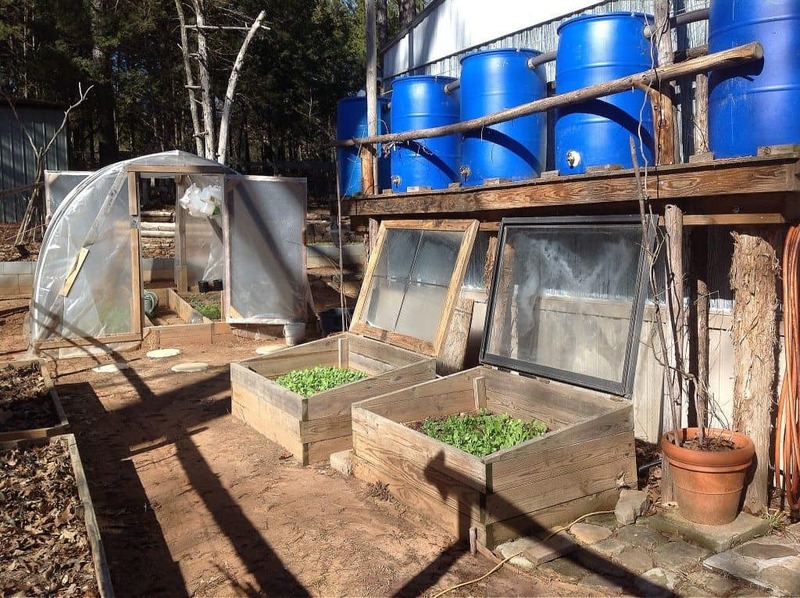 This will be the first of many in a series about Permaculture that Joel will write for this blog. 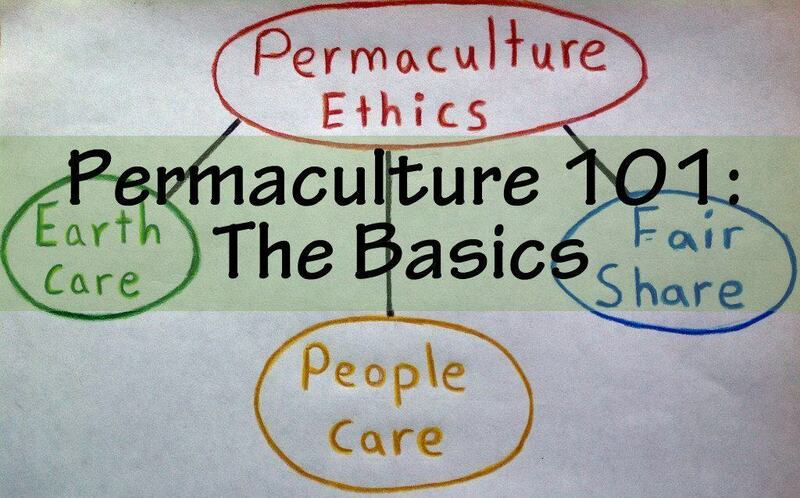 We’ll start at the beginning, however, with Permaculture 101: The Basics. Take it away, Joel! Permaculture is a holistic design system for creating sustainable human settlement and food production systems. It is a movement concerned with sustainable, environmentally sound land use and the building of stable communities through the harmonious interrelationship of humans, plants, animals and the Earth. Earth Care ~ We must provision for all life systems on Earth to continue and multiply. We depend on good health in all systems to function for our survival. Our fates are intertwined with all Earth systems. People Care ~ All people must have access to those resources necessary for their existence. Cooperation between people make healthy communities. Helping family and friends aids our own survival as well as the entire family of life. Fair Share ~ Continuous growth in a finite system must provide for a return of surplus to the Earth and people to be sustainable. If each person takes only their fair share, then there will be enough for everyone, and there will continue to be in the future. The mere beginnings of a Permaculture landscape. Notice the mushroom log in the bottom left corner. Permaculture is more than just gardening, it’s also about using all of the resources available in a sustainable manner. 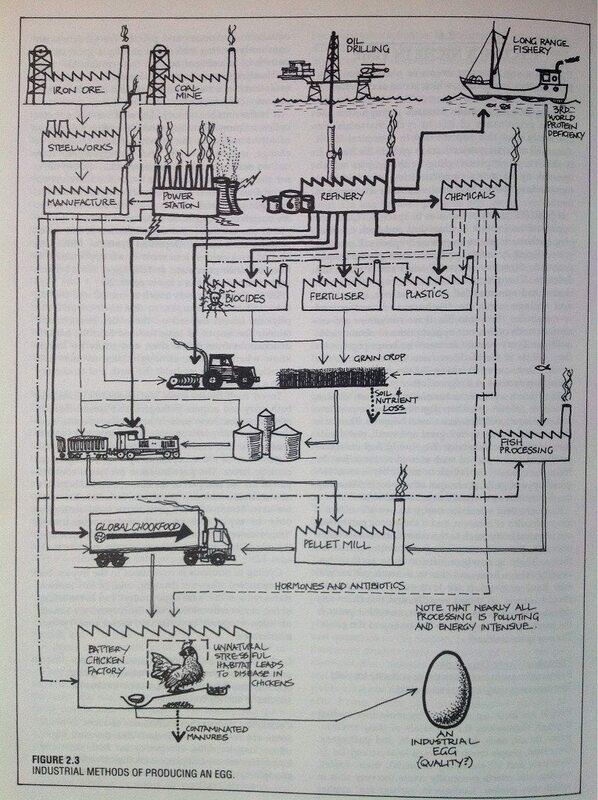 Industrial Methods of Producing an Egg. From “Permaculture: A Designers’ Manual” by Bill Mollison. The Permaculture method of producing an egg shows care of the Earth by not using unsustainable, extractive, polluting methods. The only commercially fabricated products can be recycled, repurposed and reused almost indefinitely (chicken wire, drum, roofing, guttering). All other inputs are sustainable and help provide a better, more rich Earth environment. 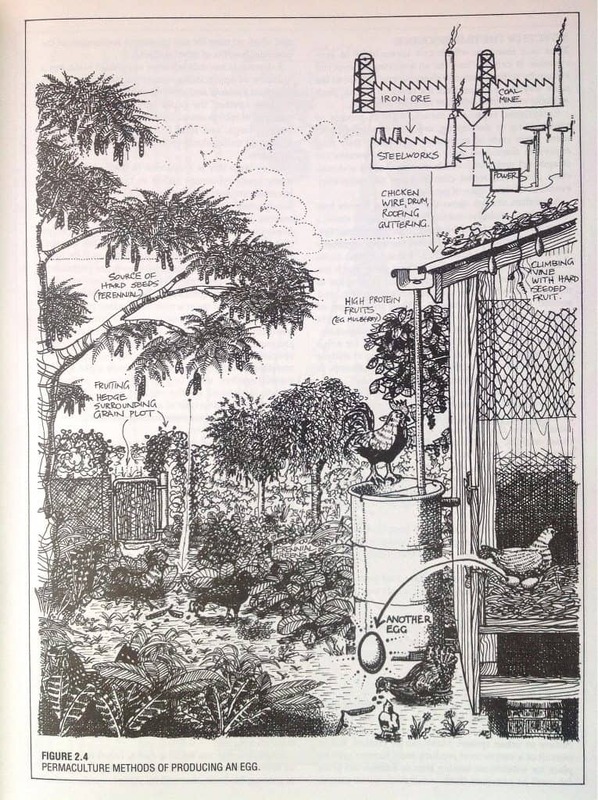 Permaculture Methods of Producing and Egg. From “Permaculture: A Designers’ Manual” by Bill Mollison. People care is exemplified by producing an egg that contains no unnatural ingredients, such as hormones and antibiotics. The industrial method produces an egg that contains these products that are detrimental to a persons health. By moving to a Permaculture method of producing eggs, more people will be able to share in the bounty by not having to rely on an expensive, energy intensive industrial method of producing an egg. This is only one example of putting the Permaculture Ethics into action, and I will talk about different systems and designs in more detail as we go along. For now, think about how you can start to move your lifestyle more towards Permaculture Ethics. With everything that you do think of Earth care, people care and fair share and I’m certain that you will start feeling more connected not only to your food, but to all of the systems that life depends on. 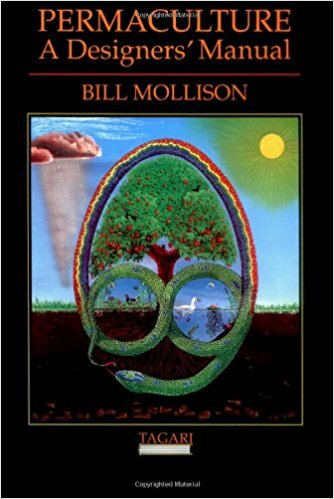 Permaculture: A Designers’ Manual by Bill Mollison, the father of Permaculture. Now I’m excited for Part 2! Hi, I just stumbled upon your blog. I also live in the rogue valley and have been thinking of turning our land into a food forest. Do you have any formal training on permaculture? I’m only asking because I was considering taking a permaculture class that Oregon State university offers this fall. I was wondering if it were necessary or do you think I could find the basics to get started in the books you recommend? Or do you have any other book recommendations on the subject? Love this!! I try to incorporate principles of permaculture into my garden and am always looking for more examples. Loved this Joel! So interesting. Now I know what you have been up to! He’s always up to something… building a rainwater collection barrel right now, haha!